There's no better place than Paris to be a writer, pretend to be a writer, or walk in the footsteps of writers old and new. Here's where to go, eat, and stay for a literary fix. 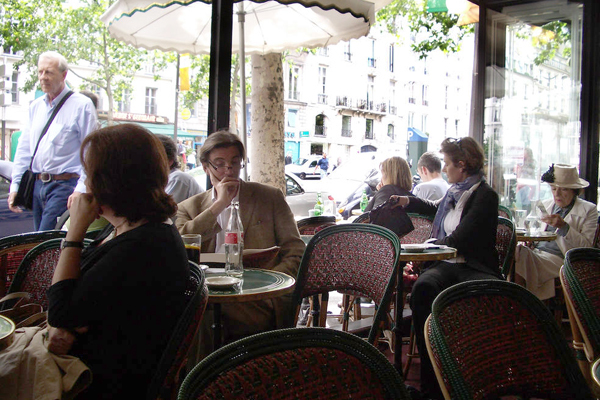 PARIS – Before you start disagreeing like a Parisian, remember that any good list of Parisian literary haunts should be highly subjective and utterly exhausting. There are more than four centuries' worth of ground to cover and wildly varying opinions on who the great writers even were. Guide books can lead you to the stomping grounds of Molière and Voltaire, to where the Marquis de Sade was imprisoned, to Maison Victor Hugo, Musée de la Vie Romantique devoted to George Sand, and even to Proust's cork-lined writing room at Musée Carnavalet. You can get maps to visit writers no longer with us at Père Lachaise, Cimetière Montparnasse, or Cimetière de Passy. But for me, inspiration comes f­­rom the writers working now in Paris, with a detour in their footsteps. Land at Charles de Gaulle, hie thee to the Left Bank, and start walking. Sylvia Beach, the patron saint of authors and independent bookstores, founded her English-language bookshop Shakespeare & Company in 1919 at 8 rue Dupuytren in the 6th arrondissement and later moved it to 12 rue de l'Odéon. Her friends included F. Scott Fitzgerald, Ernest Hemingway, Gertrude Stein, Ezra Pound, and James Joyce, whose landmark Ulysses she published when other publishers, fearing obscenity laws, wouldn't touch it. She operated on the Left Bank until forced to shutter by the German occupation in 1941. Nothing you can read will inspire you as you walk Parisian streets as much as Molly Bloom's soliloquy in Ulysses. . And it's thanks to Sylvia Beach that you're reading it. Today, the best English-language bookstore in Paris is owned by Odile Hellier, a modern-day French version of Sylvia Beach. Look for the blue doors on the tiny tucked away street. The two-story shop is packed with a thoughtful and extensive selection and helmed by a crackerjack staff who love to talk about what they're reading in the United States. Make sure to check out the reading series that draws big names such as David Sedaris, James Ellroy, Mavis Gallant, Amy Tan, and Margaret Atwood. You can also pick up the Sunday New York Times here. The store is legend, and, if you're reading this, you already know about it. While the location is different than Sylvia Beach's original, she publicly handed the name to George Whitman over dinner in 1958. George's death last year at age 98 made international news, and the store will continue to be run by his daughter, Sylvia Beach Whitman. You will find whatever you are looking for here, and you'll probably run into a long-lost friend while browsing. Two things you might not know: If you are sitting on an unpublished novella, enter sponsored by the store. The winner gets a weekend in Paris, a reading, and 10,000 euros. 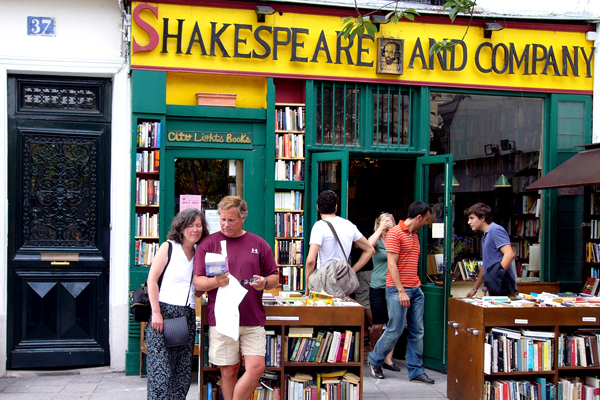 Shakespeare & Co. also hosts , a free biannual literary festival that brings well-known English and French writers together. Participants have included Martin Amis, Philip Pullman, and Jeanette Winterson. The lineup hasn't been announced yet, but the Festival should be in June this year. The biggest and most popular English open mic night in Paris, it's been going every Monday night since 2006 and is usually held at (76 rue Jean-Pierre Timbaud, 11th arrondissement; +33-1-48-06-98-22), but check the website because it can move. Everyone gets five minutes to read, and the atmosphere is supportive. Get a drink and sign up at 8 p.m. Readings go from 9 p.m. to midnight. Bon courage! Two blocks from the Eiffel Tower, The American Library in Paris is the largest English-language lending library in Europe. Founded in 1920 to send books to soldiers fighting in the trenches, the library has become a vital resource for all writers and readers in Paris and is open to all. The library hosts smart, lively book groups, a fabulous event series (Arthur Phillips, Lionel Shriver, and Fernanda Eberstadt were recent guests), and offers a clean, well-lighted place to read. The food is okay, but the real reason to go is the ambience. This is where many of the French publishers working nearby gather. 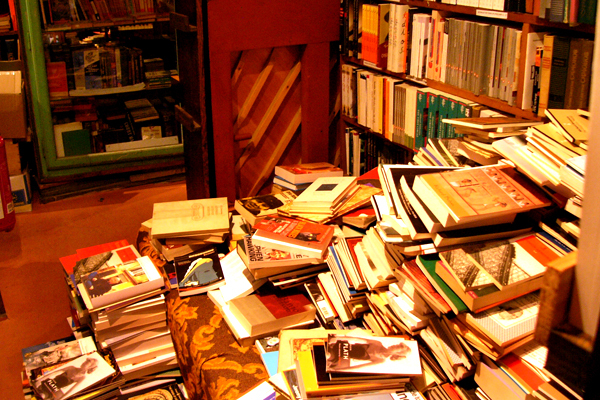 Get a bottle of wine: It will give you time to go through the 5,000+ books lining the walls. For better food, the famous Le Comptoir is right across the way (9 carrefour de l'Odéon; +33-1-44-27-07-97), although the service is a SCANDAL. My favorite restaurant in the area, which is not necessarily literary, is (4 rue des Grands-Augustins, 6th arrondissement; +33-1-44-32-00-32). I've been going, with writers and without, since it opened more than a decade ago. The name might be lame, but the food is transcendent. Sit upstairs if you want to write or eat among branché Parisians, but if you just want to watch beautiful people, sit downstairs. (No kidding: One of the last times I was here, Terry Richardson was doing a photo shoot outside and Julie Delpy walked by.) If you need something to read, look up Adam Gopnik's classic New Yorker piece "" which explains why Flore is more fashionable than next door (6 place St. Germain des Prés; +33-1-45-48-55-25), even though both are seeped in literary history. I've heard people complain that Café de Flore is overpriced, but, like anywhere, just order smart. A pot of café crème costs 5,20 euros, and you will never be hurried by the professionally polite waiters. Five euros seems reasonable to me for delicious coffee at a beautiful place, but Starbucks is rapidly encroaching all corners of Paris, so you choose. By the way, every November, the Prix de Flore, a French literary prize founded by French literary bad-boy (true! He once was arrested for snorting cocaine off the hood of a car in the 8th arrondissement), is awarded at Café de Flore. The winner receives 6000 Euros and a glass of Pouilly-Fumé. The writer Alexander Maksik told me about this absolutely perfect bar, and I'm so glad he did. (, in fact.) No tourists. Masterful bartenders: two charming men in white "smoking." Old jazz, mediocre food. Only come to drink, like a good writer should. Rosebud was a haunt of Jean-Paul Sartre as well as Marguerite Duras, whose photo is in a frame behind the bar. Near the Ecole des Beaux-Arts, the former hang of Cézanne, Picasso, and Braque is a beautiful, well-worn café where you'll want to while away an afternoon. Unless it's summer when the sprawling terrace seems like the only place in the world to be, head indoors for the less busy back room, order the vin de maison, and finish your novel. American expatriate and writer Natalie Clifford Barney ran a literary salon at 20 rue Jacob for more than sixty years. Through her doors passed seemingly everyone who picked up a pen in the 20th century: Marcel Proust, Colette, T.S. Eliot, W. Somerset Maugham, William Carlos Williams, Ezra Pound, Rainer Maria Rilke, Edna St. Vincent Millay, Djuna Barnes, Radclyffe Hall, Mary McCarthy, and Truman Capote, to name a mere handful. Famously, Ernest Hemingway never attended, although Natalie earned a malicious chapter in A Moveable Feast. One of my first stops in Paris — every trip — is 20 rue Jacob, just to put my feet in the doorway. The building has been rebuilt and isn't much to look at, but Barney's , where many of her salons were held, can be found in the garden. Not that I've never figured out how to get to it. Antoine de Saint-Exupéry, aviator and author of The Little Prince, has an asteroid named after him, an Argentinian mountain peak named in his honor, and a plaque at the Panthéon, but it feels much more private and special to stumble on at the Square Santiago du Chili in Invalides opposite métro La Tour-Maubourg. 's first Paris apartment is at 74 rue du Cardinal-Lemoine. There are no more goatherds blowing pipes, leading goats up the street, as Hemingway describes in , but it's still an incredibly charming corner of Paris. The plaque outside quotes , "tel était le Paris de notre jeunesse, au temps où nous étions très pauvres et très heureux." Translation: "Such was the Paris of our youth, the days when we were very poor and very happy." 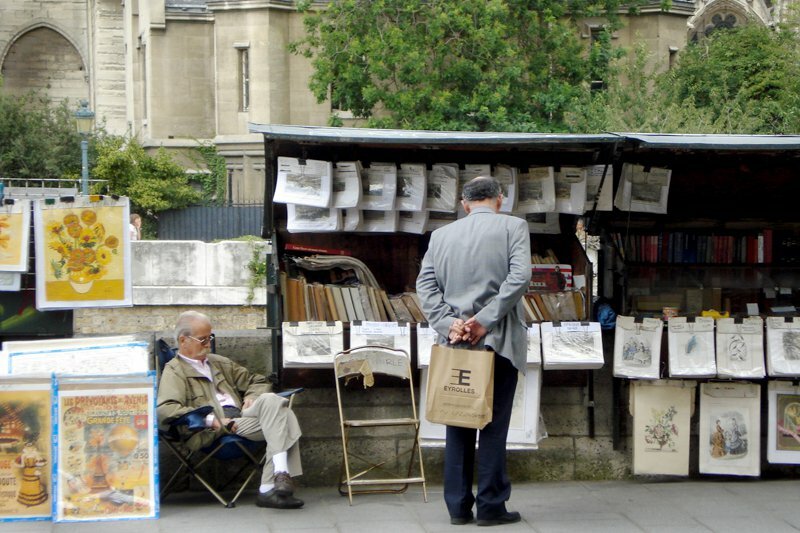 After paying homage to Hemingway, who happens to be my favorite writer of all time, get a beer up the street at any of the cafes around Place Contrescarpe and wander through the open market food stalls along Rue Mouffetard, one of the oldest streets in Paris. 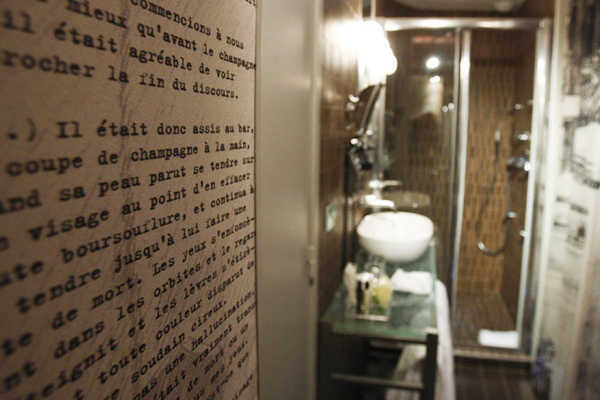 There are "literary" hotels all over Paris: ones with rooms named after authors or poems inscribed on the walls. I've stayed at the , noteworthy for its view of the Eiffel Tower and the delicious . But nevermind if Gabriel Garcia Marquez and Albert Camus once stayed here, it is seriously musty and tired. And way overrated. People rave about two "literary" hotels off-the-beaten path: , south of Jardins du Luxembourg, and the new-ish near the Elysées Palace. But in my opinion, there is no better hotel in the world than , a magical place and swoon now at its memory. Truly. That place is beyond language. If you'd like to dispense with traditional guidebooks, my favorite list of things to do in Paris, from strolls to shopping to four small museums, can be found on . A without parallel, Steven divides his time between California and Paris and represents all of your favorite writers. The most important, unique, and ethereal literary experience in all of Paris is free, in the heart of the city, and completely yours for the taking: Jardin du Luxembourg. Choose a sage-green chair, turn it to face the sun, open your book, and know what it is to be content. Kimberly, , is happiest reading an Inspector Maigret novel on Air France flight 11 JFK > CDG. You can follow her on Twitter at . She travels for the mystery.